If you follow me on Instagram, you may remember me spending a petite fortune on a brand new French skincare regime some time around the holidays. Well, apparently French women don’t have everything figured out. My face promptly freaked out. The harsh fragrance was practically assaulting my senses. And just like that, beaucoup de hard-earned money promptly went into the trash. My skin needed some serious TLC – a combination of hormones, aging, and lack of good, healthy care – and I realized I was spending more on make up to cover up my lackluster and problematic skin instead of fixing the root of the problem. It’s not the stage in life for quick fixes. It’s the stage in life to get to the root of your problems and figure them out once and for all. So I have started on a proper monthly facial regime. It may feel a little luxurious, but these visits aren’t for the spa environment, steam room or complimentary chia seed cookies (though those are lovely)…it’s for the health of my skin, my self-esteem and my long-term physical well-being. On my first visit, the aesthetician basically said, you don’t have to do what I recommend, but you need to stop what you are doing. She recommended getting back on the Clarisonic bandwagon religiously. I protested that it broke me out but she assured me you need to fight through that stage to reap the real benefits. She recommended trying pre-natal vitamins for a little while. And finally, and most importantly, she recommended Eminence. 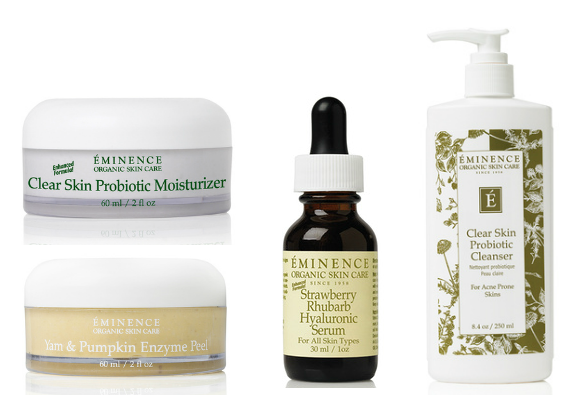 Eminence is a line of all-organic, natural products that was originally developed in Hungary decades ago and now operates its North American business from Vancouver, Canada. I have heard mumbles about it in the past but it wasn’t until trying it firsthand that I really understood the cult adoration. The line works. It has already brought about much-needed change to my skin in just a little over a month and I can not only feel good about the results, but the ingredients I am putting on my skin. Starter kit – the facialist recommended I start with this clear skin starter set to test out the products and get a sense before committing to the full regime. In just a month of changing up my routine, I have already seen marked improvement. The kit includes the Probiotic Cleanser and Probiotic Moisturizer, which I have been using twice per day (with the Clarisonic). It also came with the Probiotic Masque, which I have been using 1-2 times per week and also for spot treatments, as needed. Finally, it came with a Willow Bark Booster Serum that I was using religiously for the first few weeks. Now that my skin has settled down a bit, she recommends I save this for only 1-2 times per week moving forward. My next issue beyond breakouts is hydration. And apparently hydrating and moisturizing are two different things. So while the Probiotic Moisturizer was doing its thing, my cheeks were still in need of some extra hydration. So we’ve introduced the Strawberry Rhubarb Hyaluronic Serum (to be used daily) and the Pumpkin Latte Hydration Masque (1-2 times per week). Both smell incredible and feel like a real treat for my tired skin. I have just started on these two so can’t report the longer term effects but it’s love at first sight for now. Finally, I just ordered the Yam and Pumpkin Peel. This is the one thing I have yet to actually try, but my friend Rachel raved about it ages ago and Rachel has pretty amazing skin, so that’s enough of an endorsement for me. I will be sure to report back on my own results. So what’s my point, you ask? Well, I have found a healthy, new skincare line that I love so naturally I wanted to share that. But more importantly, I want to encourage you to do the same. With skincare, with an exercise regime, with your hair and your vitamins and your weight. We are entering a new phase of life – aging and hormones and change – and with it should come new routines, new must-haves, new priorities. Invest a little time, energy and whatever resources you can into finding the products and regimes and favorites that make you feel good from the inside out and back again. It’s not selfish. It’s not a luxury. It’s a must, my friends. PS – I have bought most of my products on DermStore.com (one of the few authorized Eminence retailers online) and find they have great discounts for first-time shoppers, Facebook fans, free shipping, etc. so take a peek. You are the third person, in completely unrelated situations, to recommend Éminence to me this week. I’ve had a longterm love affair with Dr. Hauschka (I’m the one that recommended their cosmetics to you on IG! ), but I have to admit I’m quite curious about this skincare line. I have a son, who’s currently experiencing his first bout of teenage hormones, and I’m wondering if you think this clear skin kit would be good for his changing skin? I want to say yes but I am definitely no expert, especially when it comes to male teenage skin…I will say that I did a quick online consultation via the brand’s web site chat support and it was a great help. I would try that – or call! – and see what they rec. Let me know if you try it! PS – I was almost a Hauschka convert because I have been using their Clarifying Day Oil for a while and was liking it but this line feels a little more intense in terms of active ingredients, which I like. I’m so glad to hear you like the whole line. I need a new routine and already love their eye make-up remover and Stone Crop products to help combat my dark spots (too much sun + pregnancy hormones of three pregnancies in five years). What eye cream/serum have you found that you like? And, after three kids I’m sure I should know this, but what was behind the recommendation on the pre-natals? I live in Vancouver (yeah!) and have used this product line off and on for years. I love most of the cleansers but I hate the jar packaging of the moisturizers and masks. Wish they came in a pump as I hate to stick my fingers in the jar everyday. I always forget to use the little spatula that they come with. That being said, when my skin needs a little extra love I try a new one from the line. Hi Raluca! Was wondering who and where you go to for facials? I am looking for a new place to try out in the San Diego area 🙂 Thanks! Will definitely have to check out this skincare line! I’ve been going to the Park Hyatt Aviara recently — they have some great mid-week/mid-day specials, if your schedule allows…and they use this line exclusively. Enjoy!